Cryptographic hash functions take arbitrary binary strings as input, and produce a random-like fixed-length output (called digest or hash value). It is practically infeasible to derive the original input data from the digest. In other words, the cryptographic hash function is one-way (pre-image resistance). Given the digest of one message, it is also practically infeasible to find another message (second pre-image) with the same digest (weak collision resistance). Finally, it is infeasible to find two arbitrary messages with the same digest (strong collision resistance). Regardless of the hash algorithm, an n bits long digest is at most as secure as a symmetric encryption algorithm keyed with n/2 bits (birthday attack). Hash functions can be simply used as integrity checks. In combination with a public-key algorithm, you can implement a digital signature. Every time you want to hash a message, you have to create a new hash object with the new() function in the relevant algorithm module (e.g. Crypto.Hash.SHA256.new()). You can only hash byte strings or byte arrays (no Python 2 Unicode strings or Python 3 strings). 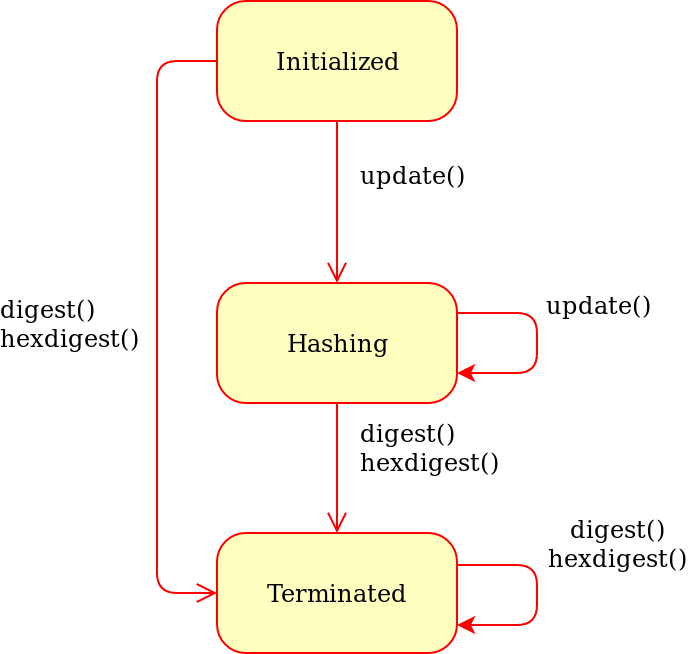 digest_size Size of the digest in bytes, that is, the output of the digest() method. It does not exist for hash functions with variable digest output (such as Crypto.Hash.SHAKE128). This is also a module attribute. block_size The size of the message block in bytes, input to the compression function. Only applicable for algorithms based on the Merkle-Damgard construction (e.g. Crypto.Hash.SHA256). This is also a module attribute. oid A string with the dotted representation of the ASN.1 OID assigned to the hash algorithm.